As I shuffled the cards to select this week's Intuitive Tuesday tarot card, I said, "Tell me what messages I need to bring to my readers this week." I selected The Lovers from the Legacy of Divine Tarot by Ciro Marchetti. 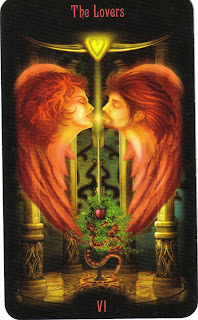 The Lovers card is a Major Arcana card, which can indicate a more spiritual, life lesson. It typically symbolizes either love and partnership or a choice between two alternatives. When referring to love, the Lovers card indicates love, sharing, trust between two people, a partnership, harmony, relationships, or a union of opposites. If indicating a choice between alternatives, you may be presented with two divergent paths, or may be sensing duality in your life or possibly being put to the test or feeling temptation. In this case, the Lovers could indicate that you are facing a crucial life decision and must decide which path to follow. A third meaning may be a combination of the two -- love and decision, which might be deciding between being in or getting into a relationship (romantic, friendship, business, etc.) or getting out of it. I have a feeling that as you read the various meanings for this card, you have a pretty good idea what it means for you. Explore your intuitive thoughts to see what's here for you. I get a hit that this may have to do with indecision. So many of my life coaching and tarot clients come in struggling with a decision that they are facing. If this is where you find yourself, I urge you to sit with the decision. Feel the "useful tension" as you stand in the space of not knowing. If you've been beating yourself up to make a decision, relax and decide not to decide -- at least for now. I'm not encouraging you to let this feeling of limbo continue indefinitely, but sometimes when we feel pressure to decide, it can turn into a logical decision instead of an intuitive one. In your self-imposed limbo state, perhaps ask for directions and guidance from the universe as you allow the answers to come to you. You can ask for information to come to you in songs, messages on billboards, or simply by opening your mind and heart through meditation. Even if you feel pressure to make a choice...ask for guidance and be patient as the answers come. You may find that as you take small intuitive steps forward, the next best step is easier to see. This will hopefully create less pressure and more movement. And then, move forward intuitively, knowing that you don't have to decide the whole enchilada, only the first/next step. Then listen again and take another step (repeat as necessary). I love the idea of self-imposed limbo, and in choosing, for a time, not to decide. Two things came to mind for me. The first was.. I recently got a job! I'm happy for financial reasons but as I set for 9 hours in a little cube answering phones I know I can't do this forever. I'm torn because I know I should be grateful to have a job but my soul needs more. There are other areas of my life this relates to also. I like what you said about looking for signs in billboards, songs..etc. I know this works. Have a great day Sheri! What stuck with me as I read your post was the idea of love, of relationship. I have been feeling like I am more and more ready to invest in friendships, to have more people in my life.